Armenia is not taking any practical steps to become a more reliable economic partner for Iran, due to which it seems to be getting bypassed by another major regional project, says economist Vahagn Khachatryan. Iranian officials this week announced the start of the drafting of a transit route to Europe, which will pass via a number of countries, including Azerbaijan and Georgia, writes the Islamic Republic’s news agency ISNA. The proposed route will start at the southern Iranian port of Bandar Abbas and is designed to bypass Turkey to reach Western countries, stated representative of Iran’s state rail company Hasan Ashuri. According to an arrangement, the route that will include rail and road links, will cross the Iranian border into Azerbaijan and will pass further through Georgia, added Ashuri. Economist Khachatryan, who is affiliated with the opposition Armenian National Congress party, says this was an expected development for him. “We should be prepared for worse things. When your partner sees that you are not serious about the possibilities of cooperation, it starts looking for alternatives,” he says. When it became clear last year that the bulk of international sanctions would gradually be lifted from Iran, Armenia’s former prime minister Hrant Bagratyan stated that Armenia would no longer be of interest to Iran. “And here is the proof. My predictions always come true,” Bagratyan, who is currently an opposition lawmaker, told ArmeniaNow, referring to negotiations between Iran and Azerbaijan on regional projects bypassing Armenia. During recent years Armenia has repeatedly tried to engage Iran in the North-South Highway and Iran-Armenia Railway construction projects, which, according to some ambitious statements, could become part of the China-promoted Silk Road project to connect Asia and Europe. 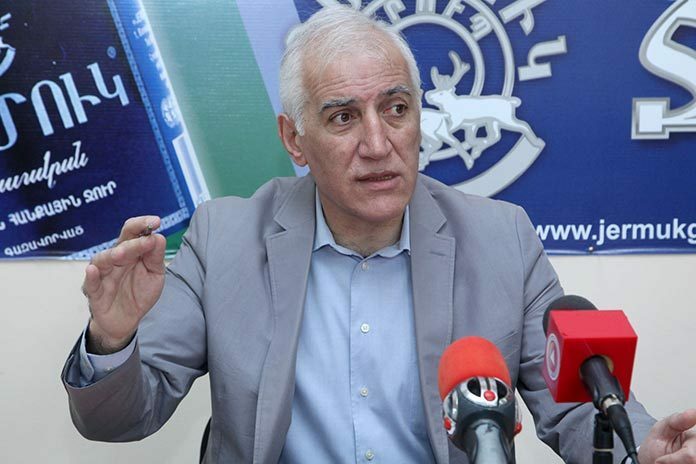 According to Khachatryan, Armenia has not gone anywhere beyond mere statements. “We only talk about it, while other regional countries are doing specific things, and we are left out of this process. We do small things, and Iran treats us the same way. We talked the construction of a large gas pipeline, but ended up having a few lines,” the economist told ArmeniaNow. According to Khachatryan, years ago when there were only talks about the Baku-Ceyhan oil pipeline construction, authorities in Armenia would downplay the importance of such projects – but time has proved them wrong. “Why did they start the North-South highway construction from the Ararat plain? They should have done it from Sisian or even Meghri for Iran to appreciate the fact that Armenia attaches great importance to its cooperation with it. This road was also used for shipments of Iranian goods in 1992, a bridge was built there when we were at war [with Azerbaijan]. And Iran had a positive attitude towards us,” added the economist who represents the political party that was in government in the early 1990s. The government, however, continues to believe in the rightness of its steps and that they will succeed. On Thursday, the Ministry of Transport and Communications entrusted to a Chinese company, Sinohydro Corporation Limited, the construction of an 18-kilometer-long Talin-Gyumri road section under the North-South Highway Corridor Investment Program. The project cost is estimated at nearly $60 million. The work will be carried out due to a loan from the Asian Development Bank.